The story is right out of a fairy tale: a baroness, buried silver, a kind old man, and a family heirloom recovered. But given Poland’s history, the remarkable story of Baroness Ruth Deech and her recovered silverware is simply an ordinary tale of historical coincidence. The account begins in 1942, when the Nazi forces scoured the Polish village of Ustrzyki Dolne, south-east of Krakow. There lived the Fraenkels, a prosperous Jewish family headed by Moshe Fraenkel, who owned an oil refinery. The Fraenkels’ Polish Christian neighbours, the Wanieks, were friends of the family, and Eugeniusz Waniek, who had moved to Krakow to be an artist and later professor of art, was at home with pneumonia at the time. The day the Nazis rounded up the Jews of Ustrzyki Dolne, Hella Fraenkel quickly handed Mr. Waniek a bundle: 16 pieces of silver cutlery wrapped in a tablecloth. The Fraenkel family was taken away, but Mr. Waniek wrapped the bundle in newspapers and buried it in the garden, where it stayed hidden until 1945. 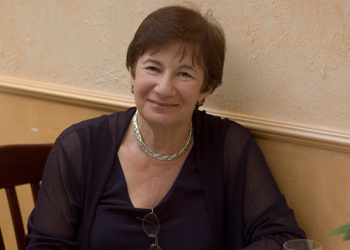 Ruth Deech, an appointed baroness and former Oxford principal and BBC governor, is Hella Fraenkel’s niece. Her father, Josef, had travelled to England right as war broke out, and she was born and raised in Britain. But last month, Baroness Deech travelled to Krakow to finally take home a lost part of her family history. For most of her life, Baroness Deech did not know about the silverware, and Eugeniusz Waniek did not know that members of the Fraenkel family had survived and were now living in England. All of this changed only because Mr. Waniak’s neighbour read a magazine article about Baroness Deech’s attempts at recovering her family’s property by threatening to sue the Polish government. Her family – the Fraenkels – had come from Ustrzyki Dolne. “He was looking for someone from my family for all these years,” Baroness Deech explained. She described Professor Waniek as “a very good man, a brave man”, someone who did not collaborate, whether with the Nazis during the war or with the communists afterwards, though his career would have benefited greatly if he had. “He did what he thought was right,” said Baroness Deech. In 1946, Mr. Waniek returned to Krakow, and with him, the silver. For 66 years the cutlery lay hidden, until upon the discovery of Baroness Deech’s existence, he made contact with her with the help of historian Norman Davies, and in September 2008 the Baroness first came to Krakow to meet the 101-year-old Waniek and collect her belongings. One might expect that such a miraculous story, featuring literal buried treasure, is rare, but given Poland’s traumatic recent history, there may be thousands of similar tales to be told. And that’s the problem Poland’s government has yet to decisively tackle. Of all of the former Eastern Bloc nations, Poland is the only one without a comprehensive legal answer to the problem of restitution. Perhaps the greatest hindrance in the drafting of such legislation is the sheer scale of the problem. The seizure of Polish property was two-fold; first, there are the properties seized by the Nazi occupiers starting in 1939. Then, the imposed post-war communist government came in and seized or nationalised further properties, including whole commercial enterprises. In some cases, there are those who survived the war and returned home in 1945 only to have their estates taken away again. The problem of property restitution is not exclusively a Jewish one either; in fact, only one-fifth of all current claims are from former Jewish residents of Poland. The rest come from primarily aristocratic families or those of the bourgeoisie, who were targeted by both the Nazis and the Communists. The estimated sum required for full compensation is about 30 billion złoty, enough to cripple the economy even if the country was not in the midst of a global financial crisis. But even if a symbolic amount of 20 percent is repaid, which is the current offer on the table, the question of who exactly will pay also remains unanswered. Should today’s generation, either in Poland, Germany, Russia or throughout the EU, pay for the crimes of their forefathers? To date, successful tales of recovered property or compensation as a result of court cases are few and far between. One piece of legislation passed concerning restitution allows for the claiming of confiscated Jewish communal property, such as synagogues and schools. However, the law requires extensive documentation in order for such claims to be made, and in the chaos of war and its aftermath, it’s no surprise that much of it has long been lost. In contrast, a great deal of property owned by the Roman Catholic Church has been reclaimed and returned. The issue of restitution offers no clear or simple solution, but in the view of those who have lost their belongings, whether whole estates or something as small but precious as silver cutlery, it is one that the Polish government needs to address sooner rather than later.